Agreement Nearing on China-U.S. Trade Deal? According to the April 3rd edition of the Financial Times, bilateral discussions between Robert Lighthizer the U.S. Trade Representative assisted by Steven Mnuchin, U.S. Treasury Secretary and Liu He, Vice Premier of China have resolved 90 percent of the issues in contention. China is requesting that the U.S. rescind all duties placed on imported items and in turn the U.S. is requiring specific assurances on implementing the trade deal and enforcing the agreement. 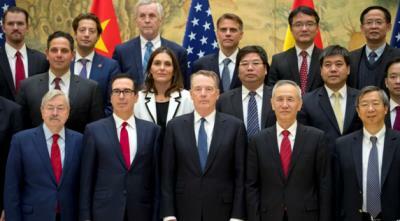 The U.S. negotiating team reserves the right to unilaterally impose punitive tariffs on China if the agreement is violated or if China makes use of the World Trade Organization to undermine the negotiated terms. Observers consider that the increased frequency of contacts in the Beijing-Washington shuttle negotiations is a favorable sign despite hawks on both sides of the Pacific. There is an incentive for both Presidents to achieve resolution since there are socio-economic ramifications from continuing the current trade impasse. From a trade perspective the Administration has a lot of balls in the air at the present time. A deal with China is not a fait accompli. Negotiations are proceeding with Japan, a member of the Comprehensive and Progressive Agreement for Trans-Pacific Partnership, precursor of the Trans-Pacific Partnership, from which the U.S. withdrew unilaterally in 2017. There are evident rifts with the E.U. with threats of trade sanctions. The USMCA has yet to be ratified by the legislatures of the three signatories. Mexico is under threats from the U.S. over northward migration of Central American refugees, Canada is aggrieved by tariffs over steel and aluminum and the Administration is threatening to withdraw from NAFTA as a pressure tactic to accomplish ratification. All this uncertainty and turbulence is impeding decisions at the farm level and impeding investment in projects and industries allied to agricultural production.